Every year the YMCA gives away a scholarship to help high school students with their college tuition! Fully complete the Scholarship Application. 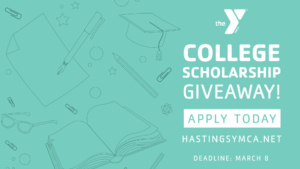 Applicants must be a Hastings YMCA Member or dependent of a Hastings YMCA Member. Applicant must be enrolled or plan to be enrolled as a full-time student (minimum of 12 semester credit hours) at a Nebraska College and Maintain a 2.5 Grade Point Average or above. High School Students must provide a current school transcript. Applicants must provide a current academic standing record.